Immensely popular and highly derided, romance as a genre has captivated audiences for centuries. Romance enchants, seduces, and ensnares its audience with narratives that envision a world that is at once fantastical and familiar, distant and immediate, impossible and yet full of endless possibilities. Over the course of the semester, we will explore romance conventions—such as the quest and venturing out into the unknown, love and desire, honor and chivalry—that persist from the medieval period to the present day, attempting to identify what exactly makes romance so appealing. Assignments include short response papers, in-class presentations, and two longer analytical essays. Our readings will begin with medieval Arthurian romances, the classic tales of love and adventure. As we move into the early modern period, we will address the role of romance in empire building and glorification of conquest. Then we’ll turn to gothic fiction written by women and featuring female protagonists. We’ll conclude the semester with more contemporary versions, including historical romance, romantic comedy, the epitome of so-called “chick lit” Helen Fielding's Bridget Jones’ Diary, and a paranormal romance Isaac Marion's Warm Bodies. 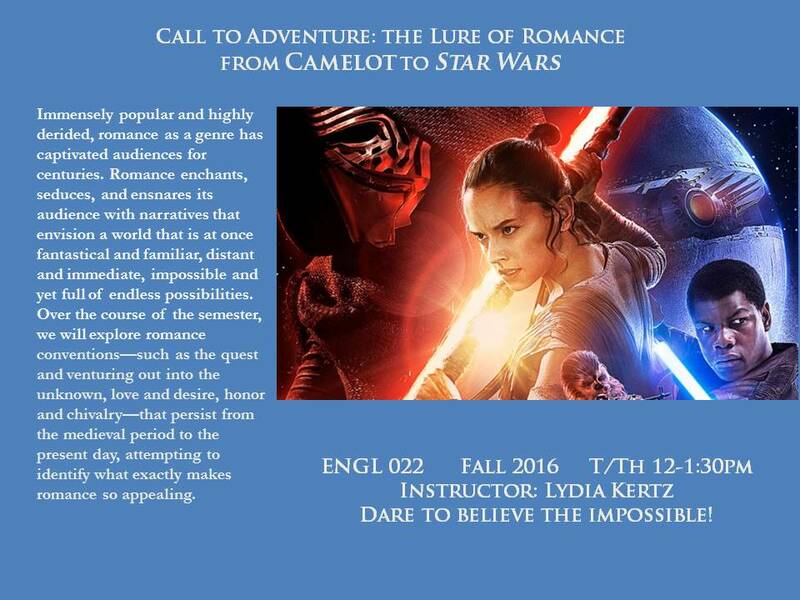 Our semester will culminate in the recent phenomenon of female-driven adventure tales with a screening of Star Wars: The Force Awakens.